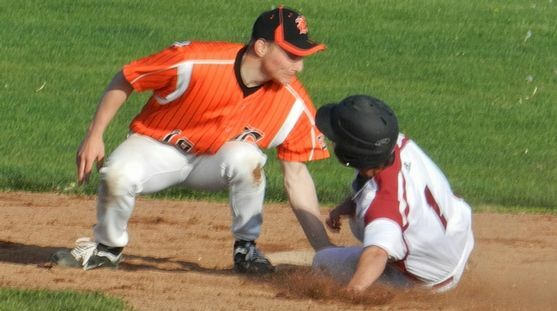 DePERE, Wis.----When the Escanaba Eskymos jumped to a 4-0 lead in the first inning against the DePere Redbirds on Friday, it looked like the boys would break their losing streak against Wisconsin teams. But the Eskymos had some of the same problems they had in the previous losses and ended up losing, 6-5, at Redbird Field. The Eskymos missplayed three pop flies that led to three unearned runs, and they stranded ten men on base as the bottom four batters in the order went a combined 0-for-16. That combination hurt junior pitcher David Falish, who threw a five-hitter. Nick Vandermissen can't get this pop fly. "It's all the little things," Eskymo Manager Kirk Schwalbach said. "I really don't know what to say. It's just the mental stuff. Pop ups. Giving up four or five outs an inning. I was really disappointed in the fact that we just didn't finish after we jumped out 4-0." Bailey Lamb's two-run single got the Eskymos on the board in the top of the first inning, scoring Austin Young and Ben Kleiman. The third run scored when the shortstop missplayed Falish's ground ball, and the fourth run came in on a Devin Olsen grounder. The Redbirds got a run in the bottom of the inning on an RBI single by clean-up hitter Jameson Dickert. But the Eskymos had a chance to blow the game open in the second inning when Young singled (again), Kleiman walked (again), and Nick Vandermissen was hit by a pitch (again). That loaded the bases with one out. But as has been the case so often this year, the Eskymos were unable to deliver what could have been a knockout punch when Lamb grounded into a force play and Falish bounced to third base. The bottom of the second inning started with DePere's Paul Koltz hitting an absolute rocket back up that middle that Falish snared out of mid-air, saving his head. Falish walked two batters in a row later that inning, but he got leadoff batter Trey Ryan to hit a fly ball to right field, so it was still 4-1. But in the bottom of the third inning, Falish ran into control problems as he hit three batters and gave up a pop fly single just past first base. The last hit-batsman forced in a run, but Falish got #8 hitter Ryan DeBouche to hit a deep fly ball that Jeff Lyle tracked down to keep it a 4-2 game. Bailey Lamb (34) scores a run past DePere catcher Ryan DeBouche. In the fourth inning, Vandermissen walked with two out and Lamb came through with a long double just past a diving center fielder in deep left-center field. Vandermisen scored all the way from first base to make it a 5-2 Eskymo lead. "I took the first pitch because it was a fastball," Lamb said. "I was thining that he would probably come back with it again because I took the first one, so I just looked for it. It came right down the middle and I took a good swing at it." Falish followed with a sharply-hit line drive to move Lamb to third base. After Falish stole second, Cam Beversluis came up and smacked a shot toward left field that was caught by the shortstop Tyler Nehring, ending the inning. In the bottom of the fourth inning, DePere (13-3 overall) got an unearned run on a missplayed pop up, a walk, and a couple of sacrafices. It stayed 5-3 because catcher Sean Bissell made a nice play to Falish on a possible passed ball, getting the ball to the plate for the tag on Ryan. But then in the fifth inning, DePere removed starting pitcher Blake Rutherford and brought in Austin DeCleene. He limited the Eskymos to just three base runners over the final three innings, and retired the final six batters he faced in succession. Jameson Dickert's home run trot. In the bottom of the fifth inning, Dickert led off with a home run to right field, the first roundtripper allowed by Eskymo pitching this season. That was followed with another missplayed pop fly, a balk, and a grounder, putting the tying run at third base. The Eskymos brought the infield in, but the Redbirds' Jonathon McCormick still executed a perfect suicide squeeze, as Falish's throw to Bissell was high. That not only tied the game at 5-5, but put the go-ahead run on base with only one out. McCormick stole second and scored on a two-out single by DeBouche. It was the second time in the game that a steal of second led directly to a DePere run on the next play. Falish was able to get out of that inning, and he pitched a scoreless sixth inning, but the "little things" that Schwalbach talked about had cost the Eskymos a victory. "I thought Dave pitched a great game," Schwalbach said. "You can't ask for much more out of Dave. The ump wasn't giving the outside part of the plate. I thought he was throwing good pitches out there, and I told him to keep throwing it, and then he got a little in tight on them (hit batsmen). But if we don't give them those four or five extra outs, it's a totally different ball game." David Falish pitched a complete game. Schwalbach was especially perplexed by the lack of execution on those pop flies, which was a repeat of what happened in a couple of earlier games this season. "We can't keep making those mental mistakes," he said. "It almost looks like nobody wants the ball. I'm gonna have to keep drilling it into them (in practice). The ball's on the ground and nobody is sprinting in to get it? In one-run games, I've told them this all year, you've got to make those plays. "It's a shame that Dave pitched the way that he did and got a loss," Schwalbach continued. "He certainly deserved a win. He got stronger in the fifth and sixth innings." Lamb agreed with his coach's assessment of the game. "It was a pretty tough loss," the sophomore first baseman said. "It was a game that we could have won, but we just didn't play the full game, and we came up short." Falish went the distance for the second straight outing. He allowed five base hits, six runs, but only three of them were earned. Offensively, the Eskymos had seven hits: Lamb and Young each had two hits, while Falish, Vandermissen, and Travis Heller had the others. Happy Birthday, Coach Randy Kleiman! The Eskymos (10-6) don't have much time to dwell on the loss. They host the Lions Club Tournament at the Al Ness Field on Saturday. Marquette plays the Menominee Legion team at 10:00. The Eskymos face Negaunee at 12:30. The third place game is at 3:00, and the championship game is scheduled for approximately 5:30. Both Eskymo games will be broadcast live on WCHT-AM (600), and on-line at www.rrnsports.com. Click the thumbnails in the "ARTICLE HIGHLIGHTS" box to see all of the pictures from the game, taken by Kevin Lyle.